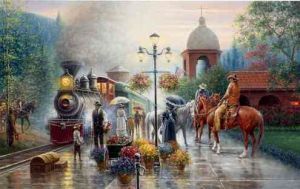 The train depot was a central attraction in turn of the century America. As the young boy peddles his newspapers, the older gentleman has received a fresh shipment of colorful bouquets. The cowboys timed their trip perfectly to pick up "Flowers For The Misses."